This week's Harris-Decima poll shows little movement from last week's, except in BC where the Tories surged to 47%. The NDP is up in Québec, though from very low levels: 11% last week to 15% this week. Given the incredible amount of action today on the projection front, I'll recap what happened. Five polls were published and the regional breakdown of another became available, so the results from six surveys were incorporated into the projection: Angus Reid, Nanos, Harris-Decima, Abacus, Léger Marketing and Forum Research. The aggregate projection is now based on 17 polls, although the 6 from today account for over 5/8 of the weight. Despite the fact that over 5/8 of the projection is new, the numbers changed little. The average Conservative national lead went from 11.4% to 11.0%. The Tory seat loss and the NDP seat gain were modest (4 each), while the Liberal (+1) and Bloc (-1) counts barely changed. Still, these are the first changes since April 13, when only pre-debate data was available. We can see that the debates were good for Layton, but did not have a big impact on Harper's quest for a majority or on the Conservative/Liberal race. In the west, the only changes were in Manitoba, where the NDP took back Winnipeg North from the Liberals and Elmwood--Transcona from the Tories. In Ontario, the NDP took Sudbury back from the Liberals. 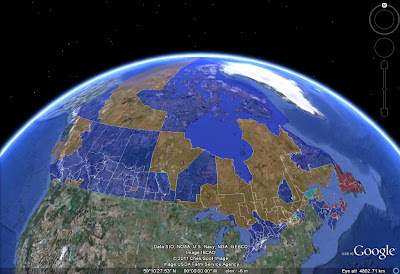 In Québec, the NDP gained Gatineau and the Liberals gained Haute-Gaspésie--La Mitis--Matane--Matapédia, both from the Bloc. However, the Bloc took Chicoutimi--Le Fjord back from the Tories. In Atlantic Canada, the Liberals gained Egmont, and took back Random--Burin--St. George's, both from the Tories. All parties are now within 3 seats of their 2008 result. The current projection is the highest of the campaign for both the NDP and the Liberals, and the lowest for both the Conservatives and the Bloc. 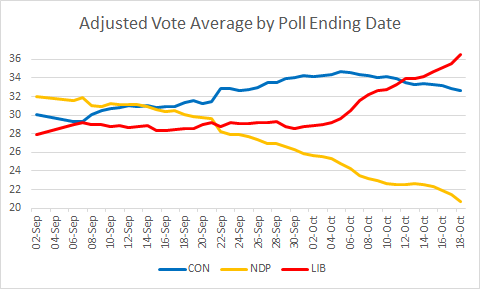 While the NDP is definitely doing well and the Bloc poorly, one should probably not reach the same conclusions about the Liberals and Tories, for whom volatile Atlantic numbers are making the difference. In Sudbury the Liberals did not have a seat in the last Parliament. It was NDP. 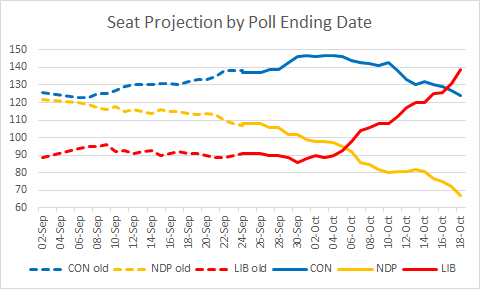 What I meant was that the seat was projected to go to the Liberals, but the NDP isn't projected to lose it anymore.